Please note, my inclusion of photos in this gallery does not in any way indicate an expectation that they will or should receive comments. That choice is, and always has been, entirely up to the viewer. Hoar frost like this is not a common occurrence where I live. I love seeing it and trying to photograph it. Beautiful capture, nice light and detail! Absolutely marvelous to see the hoarfrost on the poppy seedheads like this! You have done extremely well! You have isolated the subject very nicely with your chose f/stop, great photo. Tough to capture hoar frost but you've done a fastastic job of it. The Hoar Frost is so lovely. I've never seen it in person, but if I ever do I'm going to try to get photos as well. Even, if it is with my cell phone. This is a wonderful photo. Great capture, E. My first thought was “Oh No” this can’t be happening in April. Then I saw where you took this photo in November 2016. Now that makes more sense. 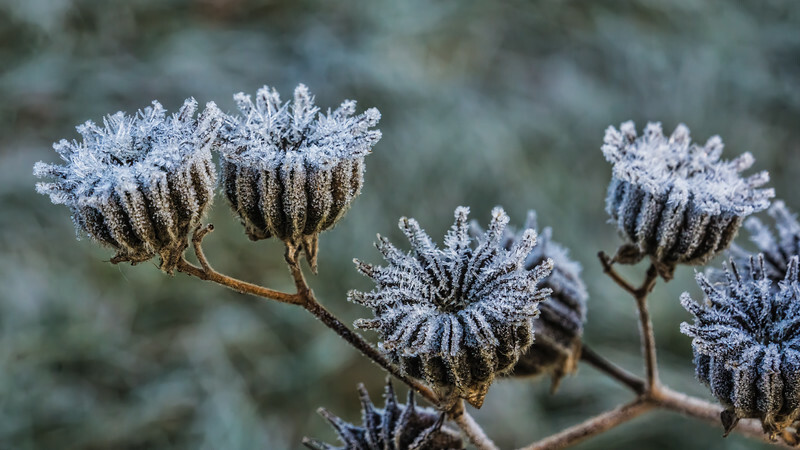 I love the frost, especially on those interesting seed heads. When I lived in Boulder, CO, in 4 years, we only had one hoarfrost. It was magical, and we went out for a drive just to see everything so covered in thick frost crystals. Just beautiful.